If you are using Beaver Builder Theme, the title that you assign to the page in WordPress is hidden on Page Builder pages by default, though you can set it to show if you prefer. For third-party themes, you might or might not have the option to hide the page title. If you can't hide the title in your theme's settings, you can still hide it in Page Builder with a little extra work, following the instructions below. Adding your own page titles in Page Builder with the Heading module has some big advantages. For example, you might want a short title like "Join" in the menu, which you could use as the WordPress page title, but the title on the web page displays a longer title like "Join an Event." This works for Beaver Builder Theme and third-party themes that let you hide the page title in the theme settings. Page Builder 2.x: Click the title bar in the upper left corner to expose the Tools menu, then choose Global Settings, or just use the keyboard shortcut ⌘+U (Mac) or Ctrl+U (Windows). Page Builder 1.x: In the upper right corner of a Page Builder page, click Tools > Global Settings. On the General tab, navigate to the Default Page Heading section. To display the WordPress page title, set Show to Yes. To hide the default page title, set Show to No. If you don't see the change, try publishing, saving, or reloading the page in your browser. If you're using Beaver Builder Theme, you're done. If you're using a third-party theme and you still see the title in the theme settings, see if the theme lets you hide it. If not, follow the next procedure. First, find the CSS class selector that your theme uses to display the page title. A good way to find this information is to use your browser's Inspect Element feature to look at the class of the page heading. 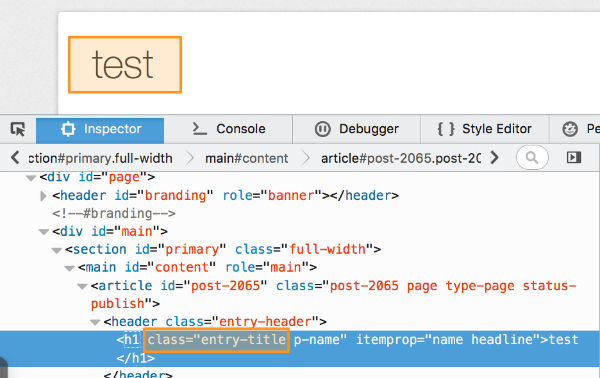 This screenshot shows an example, where the page title is "test," and the relevant class is .entry-title. On the Global Settings page, in the Default page heading section, edit the CSS selector field to match your theme. In the example above, you'd replace what's currently there with .entry-title.